Eminent domain jitters are beginning to affect the residents of southeast Texas who are apprehensive about the government’s proposed Coastal Spine project. The Coastal Spine, also referred to as the Coastal Barrier, is a proposed system of sea gates and levees that will span 71 miles in length according to the most recent designs. The system would begin on the high ground north of High Island and will span the entire length of the Bolivar Peninsula. From there, it would bisect the entrance of the Galveston Bay and continue along the entire length of Galveston Island where it would merge with the Galveston seawall. Current plans have the system terminating at the San Luis Pass. The cost of the project is estimated to be between $23 billion and $31 billion. The estimate purportedly includes the cost for environmental repairs, but critically, does not include the appraisal value of the land that the state would likely have to acquire to build the project. The Texas General Land Office (“GLO”) is tasked with acquiring the land necessary to construct the Coastal Spine. The GLO has stated that right of entry easements could be a partial solution to avoiding eminent domain, but the U.S. Army Corps of Engineers (“Army Corps”) has stated a preference for landowner buyouts. The Army Corps is optimistic that landowners will willingly sell their land for the project but confirmed that eminent domain will be used if necessary. The Army Corps is leading the design effort and recently held a public meeting at its Galveston district office with the GLO in an effort to persuade landowners that the use of eminent domain is a last resort. The GLO and the Army Corps will serve as joint project managers. The Army Corps has stated that the final alignment for the coastal barrier has not yet been decided, though a draft plan was released on October 26. Currently, the project is in a 75-day public comment period, an attempt by the project managers to solicit public feedback. Both the GLO and the Army Corps have expressed a desire to minimize the economic and environmental impact of the proposed construction. Residents of affected areas are worried about the impact that the project will have on their homes and businesses.There is substantial landowner concern that the state and federal governments may subject them to the forced seizure of their land via the power of eminent domain. Though the GLO and the Army Corps are both open to public feedback, they played down the suggestion that public opposition would scrap the plan altogether. Nevertheless, they have hinted at an alternative for the coastal spine currently referred to as the“bay rim” construction. The bay rim project is thought to be less ambitious. It would add sea gates at San Jacinto, passing through West Galveston Bay, and terminate at the Texas City Dike. This plan, with current estimates placing its cost between $18 billion and $23 billion, would be a slightly cheaper alternative to the Coastal Spine. However, the coastal spine is thought to have a superior cost to benefit ratio and is preferred for that reason. Ultimately, funding questions will have to be decided by Congress. Current thinking sees a 65/35 split between federal and state funding. The state would also be responsible for facilitating operations and maintenance through the GLO. Should the project receive funding, current estimates project a 2-5 year design phase, and a 10-15 year construction phase. Conceptual Rendering of Proposed Northwest Mall Terminal in Houston, Texas. Courtesy of Texas Central. Despite persistent controversy, Texas Central Partners LLC (“Texas Central”) continues development of its high-speed railway between Dallas and Houston. Although construction has not formally begun, the administrative ramp up that precedes major infrastructure projects like this one has already ruffled some feathers. For those unfamiliar with the project, Texas Central plans to connect the two metropolitan areas with a 240-mile high-speed train route. Early estimates predict that the train ride will take only 90 minutes, a significant time saving when compared with the alternative four-hour journey via car. Project advocates claim that the rail system will boost economic growth in the two regions by cutting down on travel time, while opponents assert that the project will burden landowners with an improper use of eminent domain power. The current construction plan is to build a substantial portion of the train parallel to an existing powerline right of way. Texas Central has been silent regarding how much of the necessary land they have already acquired, as well as amount of essential land that has still gone unpurchased. This continues a pattern of Texas Central being tight-lipped with respect to its progress with landowners, implying that many acquisitions still remain, and that efforts to acquire the necessary land have not proceeded smoothly. Progress has been further frustrated by a large number of landowners who are actively opposing the project. Indeed, many of these landowners have come together to form a grassroots opposition group called Texans Against High-Speed Rail. The organization is led by Kyle Workman, and seeks to stop the project dead in its tracks. So far, they have been unsuccessful. The primary concern of project opponents is whether private companies, such as Texas Central, can use eminent domain. A face value examination of current Texas laws suggests that railroads can use eminent domain to take land for public projects. In 2012, Texas Central registered themselves as a foreign limited liability corporation (LLC), with plans to “own, develop, build and operate a railroad.” Despite the Texas Secretary of State’s approval of this business purpose, landowners have argued that Texas Central doesn’t qualify as a railroad since it’s not currently operating any trains. In response, Texas Central, claims that the $125 million dollars they have raised and spent on the design and development of a railroad qualifies them as a railroad operator. They further point out that they’ve received federal approval of their activities. In addition to the funds already spent, the company announced earlier this year that it had raised an additional $300 million in loans from Japanese lending entities. Landowner grievances however, go far beyond the issue of whether a private company’s use of eminent domain is permissible. Many property owners have expressed concerns about the long-term effects that the project may have on their lands and livelihoods. For instance, most of the high-speed rails will be elevated on earthen berms to avoid stopping for intersecting roadways and other tracks. Many of the landowners potentially affected by this project are ranchers, passionate about their way of life, and determined to continue living it. Some have been on their land for generations; they were raised on it, and intend to raise their children on it. Their lives are rich with heritage and tradition, inextricably tied to the land they currently inhabit. These landowners worry about the berms in particular because they will form inaccessible barriers for livestock, tractors and other farm equipment. As a response, the company has promised to add pass-through culverts in portions that will be bermed. Another argument is that building a berm through the property will hurt its value by splitting it into two separate tracts. Others worry on how they will be able to pass down the land to their families. Texas Central has begun to sue landowners who wouldn’t agree to let the company survey their properties. More than 20 of those cases have settled and over a dozen others have dropped. To date, no court has rule definitively on the issue of whether Texas Central actually has condemnation power. While both parties await a decision, Texas Central continues their plan for land acquisition. Texas state officials side with Texas Central since the state’s transportation budget hasn’t kept pace with the developing areas. State leaders have thus welcomed private investment into mass transportation. Additionally, Texas Central’s promise that their project will provide jobs and spur economic development, has helped solidify support from government officials and business leaders. The legislature may be the most visible battleground where the fight between the high-speed rail and private property values is taking place. On the one hand, the rail is a privately funded transportation infrastructure, the product of a robust and unrestrained free-market economy. On the other, it is an instance of free market activity which runs in direct opposition to another of Texas’ cornerstone values: private property rights, the ability of a landowner to enjoy the use of their land to the fullest and freest extent. What therefore, could be more contrary to private property rights than the forcible seizure of land? For two legislative sessions running, the free market has emerged the victor. Bills initiated by project opponents, designed to slow or eliminate the project, have suffered proverbial derailment, for now leaving the project clear to proceed, full steam ahead. Whatever the fate of Texas Central’s HSR project, it has become clear by this point that the project, and with it, the specter of eminent domain, will not be going anywhere anytime soon. Affected landowners may wish to begin familiarizing themselves with their legal options. Short of legislative intervention or some other such response, a strategic assertion of their legal rights may be the landowners’ best chance of ensuring fair treatment in the face of this difficult process. Image of natural gas pipeline being installed. Courtesy of Consumers Energy. McGuireWoods Consulting, a national government relations and public affairs consultancy has released a Natural Gas Pipeline Fact Sheet for the year 2018. The document reports natural gas pipeline activity in the United States across five different timeframe categories, differentiated by the degree of project completeness: 1) Completed Pipelines, 2) Pipelines Under Construction, 3) Approved Projects, 4) Projects with Applications Pending, and 5) Announced Projects. The report provides coverage of natural gas pipelines for a period beginning 2018, and extending out to 2025. It also gives the project name, its operator, and the state(s) it will affect. As could be expected, projects relating to Texas feature heavily in this report in all five timeframe categories. However, pipelines affecting Texas feature most prominently in the second (Pipelines Under Construction) and fifth (Announced Projects) timeframe categories. This would suggest that though the level of construction activity in Texas is already quite high compared to national levels, there will likely be little to no abatement in the rate at which construction activity will occur in the future. Texas landowners should be aware that a substantial volume of pipeline construction will likely occur over the next few years, and pay close attention for the arrival of new projects impacting their properties. Image of 2015 explosion in Waxahachie, Texas. Courtesy of CBSDFW.com. A recent safety report found that Atmos Energy Corp. (“Atmos”) has one of the worst safety records in Texas. The report compiled a list of incidents occurring between 2006 and the present. The findings revealed that more than two dozen homes have been destroyed by explosions occurring on a network of natural gas pipelines owned and operated by Atmos. In addition to the massive amount of property damage, nine deaths and twenty-two severe injuries have resulted from these explosions. For context, Atmos’ largest division, Atmos Mid-Tex, has received five times more safety violations than CenterPoint Energy, a Houston based utility corporation and major competitor to Atmos. Leaking pipelines are dangerous as the substances transported through the lines are often flammable, explosive, and of a volatile nature. Leaks can fill an exposed area with hazardous gases or liquids which, if ignited, can result in fires and explosions. In the past decade alone, Atmos has received over 2,000 safety citations from the Railroad Commission of Texas, the government agency in charge of instate pipeline regulation. The citations have been assessed over approximately 30,000 miles of pipeline. By comparison, CenterPoint Energy (“CenterPoint”) has received just over 400 citations across roughly 33,000 miles of pipe. Put mathematically, CenterPoint has roughly 10% more pipeline and 80% fewer citations than Atmos. A citation means that the Railroad Commission has identified a safety issue, but has provided the company an opportunity to become compliant before a penalty is formally assessed. One of the most frequent safety issues for which Atmos has been cited is gas line corrosion. Historically, Atmos has repeatedly failed to replace worn out components such as pipe connectors, which could cause a pipeline leak if the part fails. Another major driver of Atmos’ problems is the fact that many of their lines are very old. In the Dallas-Fort Worth Area, Atmos’ pipelines account for roughly 35% of the pipelines installed before 1940. Some amount of pipeline corrosion is expected, but age plays a major factor for several reasons. The first is the fact that older pipelines are made from outdated materials such as bare steel or even cast iron, which are more prone to failure than modern materials. Further, a large driving factor in corrosion is the seasons. During periods of drought, the ground naturally shrinks and contracts, exerting pressure on the pipelines, creating leaks. During periods of rainfall or ice formation, the ground expands quickly, exerting even more pressure on the pipes. Modern pipelines are constructed with materials designed to withstand these natural forces, but the combination of less durable materials, as well as the sheer period over which these natural forces have had to operate, means that older lines come with substantial risks. Atmos has stated that it takes safety issues seriously, and has made strides to improve its record. It points out that the number of incidents has dropped off in the last five years by more than half. Further, since 2010, the company has implemented a rigorous employee training program to improve its response to these incidents. It has even gone as far as constructing a simulated city where employees can practice responding to leak events and other emergencies. Finally, the company has stated that it doesn’t believe older pipelines are necessarily more dangerous than new ones. The company has a plan in action to eventually replace all its old lines with pipes made of modern materials. Critics note that Atmos’ plan to replace old pipes does not operate on a quick enough time table. In comparison, CenterPoint has already updated all the pipes in its network with modern materials. Further, critics argue that the issue is not just identifying problems, but ensuring that the speed of repair is adequate to ensure safety. Indeed, in one case, a gas explosion which decimated a home and severely injured a young child, occurred while repairs were underway. Even with modern pipeline technology, the only way to absolutely prevent pipeline incidents is to never have one on the property. Landowners faced with condemnation proceedings for a new pipeline across their property should take steps to ensure that they are appropriately compensated and their rights are fully protected for the significant risk they are being forced to bear. Image of ONEOK’s West Texas LPG pipeline system. Courtesy of http://www.tankstoragemag.com. ONEOK, an Oklahoma-based natural gas company, has announced plans to expand its West Texas LPG Limited Partnership (“West Texas LPG”) pipeline system. The West Texas LPG system is a pipeline network that provides natural gas liquids (“NGL”) takeaway capacity for Permian Basin producers. The expansion will supply six third-party natural gas processing facilities located in the Permian Basin. Permian Basin processing facilities produce an estimated 60,000 barrels of output per day, consisting of a variety of natural gas products such as propane, butane, and ethane. Expanding the LPG system is expected to cost $295 million. The expansion project is predicted to be completed in the first quarter of 2020, and includes a variety of additions to the existing infrastructure. Four new pump stations are being added while two existing pump stations are being upgraded. Further additions include new sections of capacity-enhancing “looped” pipeline (pipeline which runs parallel to existing lines) to the existing West Texas LPG system, expanding transport capacity by 80,000 barrels per day. Finally, the West Texas LPG system will be connected to ONEOK’s Arbuckle II pipeline that is currently being constructed. In July, ONEOK purchased Martin Midstream Partners LP’s stake in the West Texas LPG pipeline for $195 million thereby acquiring full ownership of the pipeline system. ONEOK purchased their initial 80% interest in West Texas LPG back in 2014. This project constitutes the company’s second expansion upgrade to the system. In total, the existing pipeline network is made up of roughly 2,600 miles of natural gas liquids pipeline in Texas and New Mexico. The system serves the Permian Basin, transporting liquid natural gas from the Basin to processing plants in Mont Belvieu, Texas. The Basin is one of the largest and fastest growing shale fields in the U.S. Natural gas production from the region has risen over thirty percent from the last year to roughly 11.5 billion cubic feet per day. Because the West Texas LPG project is still in the early stages, the exact route and specific properties to be impacted are not yet known. Landowners with interests in the relevant regions, or who are already familiar with the system’s existing layout, should be on the lookout for any signs of this project’s progress. A request to survey is often the first sign that a piece of property is likely in the path of an upcoming project. Image of beaches in Santa Barbara County following 2015 oil spill. Courtesy of The Santa Barbara Independent. Plains All American (“Plains”), a Houston based pipeline company, was found guilty of nine criminal charges for its role in the worst oil spill to occur on the California coast in the past 25 years. Contrary to what many may assume, it is well-established that a corporation, rather than individuals, can be convicted of criminal charges. For a high-profile example, BP, formerly the British Petroleum Company, plead guilty to eleven counts of voluntary manslaughter following the Deepwater Horizon disaster where they were ordered to pay $4.5 billion in penalties and fines. In the same vein as the BP case, a Santa Barbara County jury convicted Plains on nine of the fifteen criminal charges brought by the Attorney General of California including one felony count of failing to properly maintain its pipeline and eight misdemeanor charges. The misdemeanor charges included destruction of protected wildlife, such as marine mammals and seabirds. The pipeline breach occurred just a few weeks before Memorial Day in 2015, and the resulting oil spill forced multiple beaches and campgrounds to shut down for two months. The pipeline breach was caused by corrosion in the line, and resulted in at least 123,000 gallons of crude oil flooding the Refugio State Beach. The incident also put a damper on the local tourist economy and fishing industry. The surrounding oil industry was also stifled by the breach because the pipeline supported local refineries by transporting crude oil from seven offshore rigs. The rigs have remained idle since the spill. Plains pleaded not guilty to the charges stating that it believed its operation of the pipeline met or exceeded both industry and legal standards. The company’s view is that the jury incorrectly decided the case, and it points to the fact that, despite the guilty verdict, the jury did not find any knowing misconduct by the company. Plains has stated that it accepts full responsibility for the accident, and is in the process of exploring all of its post-conviction legal options. Federal inspectors however, assert that the company committed several preventable errors. Plains operates the pipeline from a control room in Texas which is over 1,000 miles away. Prior to the incident, operators in the Texas control room had disabled an alarm which would have signaled a leak. As a result, the operators were unaware that a spill had occurred when they restarted the pipeline. The preventable restart of the already ruptured line caused the incident to compound in scope. Plains has formally apologized for the spill and paid for cleaning and restoration efforts. So far, the spill has cost the company $335 million in clean-up, not including lost revenue, according to the company’s annual report. Despite the incident, the company is already seeking approval to repair or rebuild corroded pipelines. It has also filed an application to construct a new pipeline in the same location. Plains is scheduled to be sentenced on December 13. Because Plains is a company and not an individual person, it faces only fines. The severity of the fines Plains could face is unclear. Whatever the trial court imposes, this case is only the beginning of Plains’ legal issues related to this accident. The U.S. Government has yet to weigh in on the issue, and could decide to impose additional fines. Further, Plains faces a federal class-action lawsuit. The plaintiffs in that case are the owners of beachfront properties, fishing boat operators, the oil industry, and oil workers who have lost jobs due to the accident. What this means for the average landowner is that despite the assurances of pipeline companies that preventative measures are in place to prevent spills, accidents still occur. Landowners with pipelines constructed across their properties are forced to live with this risk. Power lines near Thompsons, TX. Image courtesy of Houston Public Media. The Journal of Real Estate Research recently published a study by Chris Mothorpe and David Wyman, assistant professors at the College of Charleston, concluding that a property’s vicinity to high-voltage power lines can negatively impact its value. Unlike prior investigations that had similar conclusions, Mothorpe and Wyman focused solely on vacant lots of land, as opposed to lots with constructed homes, to ensure a pure translation of the damages to the tract of land. 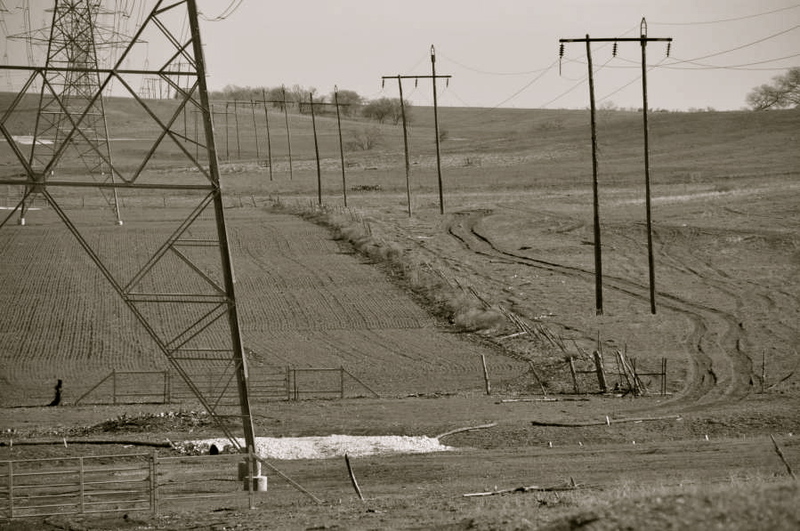 The study found that vacant parcels adjacent to high-voltage powerlines sold for 45% less than similar lots that weren’t located near powerlines. Parcels that were non-adjacent, but within 1,000 feet of a powerline sold at an 18% discount to comparable parcels located further away. In order to make the numbers meaningful to actual homeowners, the study combined the numbers regarding vacant land with data describing the proportion of a property’s value made up by the land alone. To do this, the researchers assumed a market where land accounted for 20% of a home’s overall value. Therefore, a 45% decrease in the land value alone, due to its being adjacent to a high-voltage powerline, would yield a 9% drop in overall property value. Mothorpe and Wyman created a data set from sales of 5,455 vacant parcels sold between 2000 and 2016 in Pickens County, S.C. The lots were located around a network of high-voltage powerlines transmitting power from the Oconee Nuclear Station. Three primary factors are cited as causing the discount. First, buyers are concerned by the perception of adverse health affects associated with nearness to high-voltage powerlines. Second, buyers tend to find the powerlines visually unappealing. Finally, high-voltage lines produce an audible humming noise easily perceived by those residing nearby. Of the three, researchers believe that the visual factor is the most problematic for potential homebuyers. Studies like these are important to the landowner for at least two reasons. First, they provide an empirical foundation for the overwhelming landowner preference against the presence of high voltage lines. These studies can help support appraisals which assert property damages based on proximity to an incoming powerline. Second, these studies should put landowners on notice that powerlines being built in the vicinity of their home can have a very real, and negative, impact on property value. The Cascade Mountains. Image courtesy of Cascade Climbers. Texas is in the midst of an oil and gas boom. The Permian Basin is quickly becoming the largest producing oil field in the world and shows no signs of slowing down. Elsewhere, environmental activists are coming up with unique, and so-far effective, strategies of blocking the expansion of oil and gas pipelines. Environmental organizations have gotten creative and are using State’s rights as a sword rather than as a shield. In the past, the Federal Energy Regulatory Commission (“FERC”) would approve interstate pipelines and they would be built. State’s rights were a shield for protecting against environmental harm, but they had little impact on preventing the actual construction of pipelines. Now, activists have flipped the script and have begun employing Section 401 of the Clean Water Act (“CWA”) as a weapon against the oil and gas industry. Section 401 gives states the right to review new projects to ensure that they will not negatively impact the local water supply. Environmental organizations, such as the Waterkeeper Alliance, are claiming that Section 401 results in States having “veto power” over FERC’s decisions meaning that the State can unilaterally deny the Clean Water Act Permit. So, how does the strategy work? It is quite simple. It requires the support of the State government, a finding of environmental harm, and a denial of the Clean Water Act permit. This is largely a political process which is why these activists have narrowed their sights on more left-leaning states like New York and Oregon. In New York, the strategy successfully stalled the construction of the Constitution Pipeline. The New York State Department of Environmental Conservation denied Clean Water Act certification to the pipeline even after the pipeline received FERC approvals. In a victory for the environmental activists, the United States Supreme Court denied the pipeline company’s request to appeal the Second Circuit’s decision thereby leaving New York’s decision intact. In Oregon, groups like Rogue Climate are hoping to repeat the victory in New York in their fight against the Jordan Cove project. The Jordan Cove pipeline is designed to transport natural gas across the Cascade mountains to the Oregon coast. Some activists believe that if they can stop pipelines like Jordan Cove, they can help reduce the demand for drilling, because who wants to drill for a product that can’t make it to market? But enough about New York and Oregon. Let’s get back to where we started, Texas. Is there a path to victory for environmental activists via the Clean Water Act in Texas? The simple answer is probably not. The key to success for this strategy is a political one. In Texas, there is no side of the political aisle that wants to go to war with oil and gas companies because of their importance to the state’s economy. Thus, despite their strategic success in other parts of the country, environmental activists are unlikely to prevail in Texas.